Trane Supply is here to support your needs. From OEM parts to wholesale supplies, emergency replacement equipment and rentals. Description: Supporting Every Degree of Your Business. 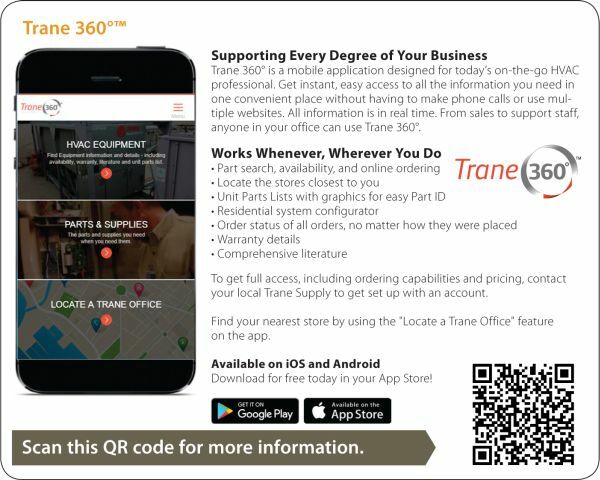 Trane 360° is a mobile application designed for today’s on-the-go HVAC professional. Get instant, easy access to all the information you need in one convenient place without having to make phone calls or use multiple websites. All information is in real time. From sales to support staff, anyone in your office can use Trane 360°. To get full access, including ordering capabilities and pricing, contact your local Trane Supply to get set up with an account. Trane Supply is here to support your needs. From OEM parts to wholesale supplies, emergency replacement equipment and rentals. Click here to view more information about this product. Convenient locations to serve you! 124 E. I-65 Service Rd. N.
19 Colonel Glenn Plaza Dr.
20450 E. Walnut Dr. N.
1265 19th St. Ln. N.W. 5501 San Diego Ave. N.E.